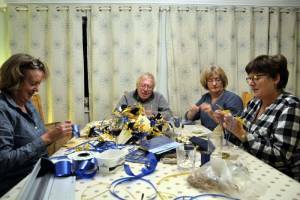 WE HAVE FUN (We also get together regularly for social events with our partners and families who seem to love the social opportunities that our Rotary Club gives them. 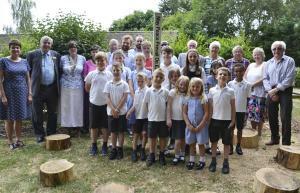 Family, friends and Rotarians dedicated a Peace Pole at Thurlby Community Primary School in memory of Ann Wadkin who ran a Pre-School for many years and was an active member of the Rotary Club of Bourne St. Peter. 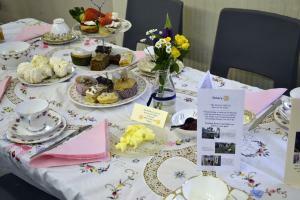 We raised approximately £350 for charitable causes. Thanks to those club members and friends who worked hard to launch this event, including our three young lady models and the public who supported us. Presentation to St. Barnabas Hospice of Virtual Reality (VR) systems for use by their nurses, to allow patients to relive memories or return to places of emotional significance. A District Matching Grant enabled this project to complete quickly. 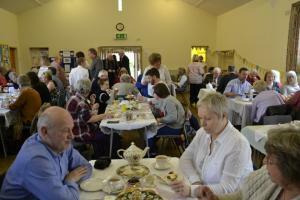 84 people enjoyed a scrumptious selection of sandwiches, cakes, pastries and refreshments. We raised over £1,000 to be used towards the purchase of "Visual Reality" systems to be used by our local nurses at St. Barnabas Hospice for areas of health care. Thanks to everyone who took part in our Tombola Stall both in the preparations and on the day, including the public who so generously supported us - a good result. 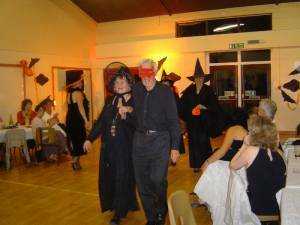 Our event raised £356 for the St. Barnabas nurses in Bourne. 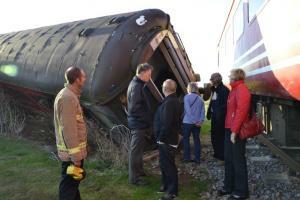 Thanks to everyone who helped and members of the public who supported us. 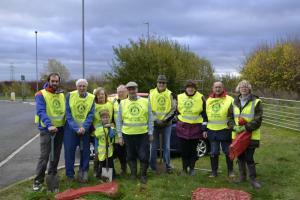 We were at it again today planting 4 sacks of daffodils and over 1,000 crocus bulbs in Bourne Town. Many thanks to all those who assisted in the planting. 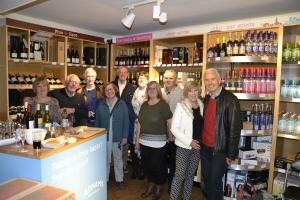 Several of us enjoyed an evening tasting a selection of wines accompanied with nibbles at the Adnams retail shop in Stamford. Tom, a qualified wine connoisseur with a wealth of knowledge explained the origins of each wine. Quizmaster and keeper of the scores Martin & Janice Hill did an amazing job controlling about 70 contestants over 10 rounds of questions and a dingbats challenge. 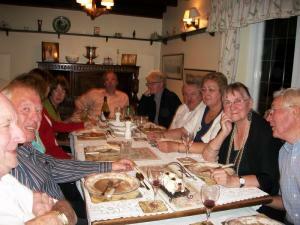 A fish and chip supper was included. 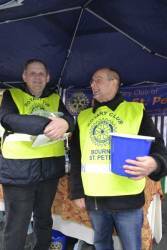 All proceeds to St. Barnabas and Rotary Charity. Speaker evening with Adam Henderson, Area Manager of Mencap Charity. 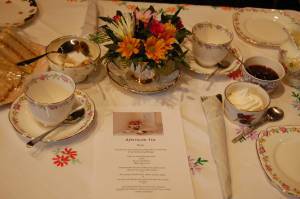 Meet at the Toft House Hotel at 7:15pm for meal at 7:30pm. Adam Henderson, Area Manager of Mencap will share with us the opportunities we have to help their 'Service Users' in improving the allotment facilities in Stamford and Bourne. Charity Supper Evening with outdoor games, a quiz and lots of fun was kindly hosted my Alan and Maggie and attended by more than 20 people. 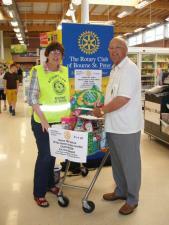 Donations were gratefully received to support the excellent work of our Rotary Charity. We have just supported a local family with a donation towards a hydrotherapy treatment facility for boys Ben and Sam who have the genetic condition Duchenne Muscular Dystrophy. At present there is no cure for the boys so every minute counts. On a chilly day, we were all hands-on working our Tombola and Glitter Tattoos stall. 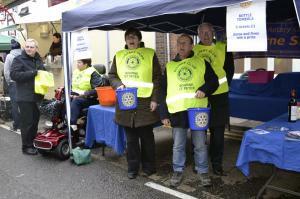 All proceeds will be donated to worthwhile Rotary Charities that will benefit from all our efforts. Thank to all our helpers and supporters. 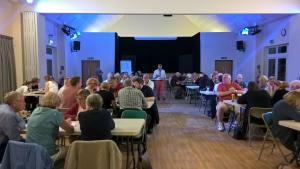 Another very successful event held in the Bourne Abbey Church Hall attended by 80 people who enjoyed a scrumptious selection of sandwiches, cakes, pastries and refreshments. 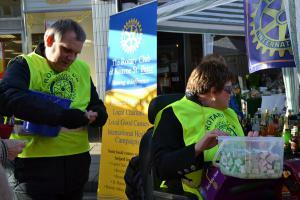 All proceeds will go to The Lincs & Notts Air Ambulance and the Rotary Charity. 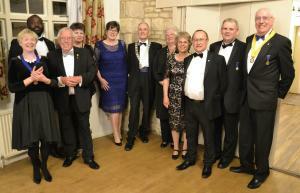 On Tuesday 20th June our Presidential Handover evening was kindly hosted by Jacky and Bryan Summers at their home - good food, good friends and good weather made the occasion a most enjoyable evening. 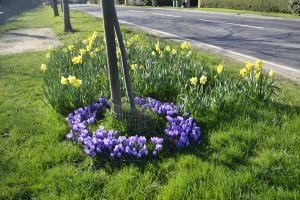 A display of our daffodil and crocus bulbs planted in Bourne town. The purple crocus are a symbol of the Rotary International programme to eradicate polio in the world, and Rotarians with the help of other organisations have nearly achieved this goal. We displayed our "Rotary Tree of Wishes" along with 35 other trees from local organisations at the Bourne Methodist Church Christmas Tree Event. We show photographs of our tree (No. 28) along with a selection of other exhibits. 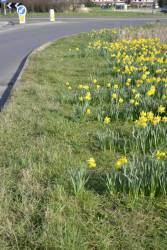 As last year, we will be planting bulbs on both the Bourne By-Pass roundabout area and the North Street approach into Bourne town. 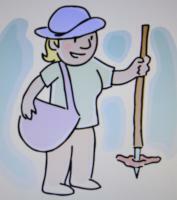 Meet at the by-pass roundabout at 10:30am with tools and suitable footwear. Please bring along some volunteers to help. 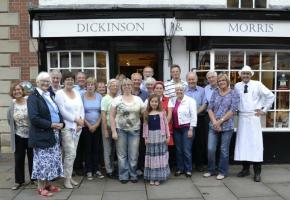 Twenty of us attended a make your own pork pie session at "Ye Olde Pork Pie Shoppe" in Melton Mowbray. Demonstrated by baker Keith and assistant Christine. Winner of the "Best Pork Pie Maker was Keith Gatland - well done Keith. 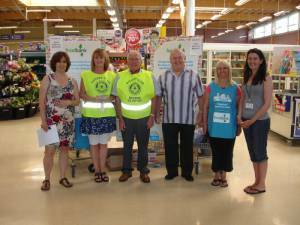 Supporting St. Barnabas Lincolnshire Hospice. Last night Club President Sue Bullock (on the RHS of the photograph) presented a cheque for the sum of Â£215.50 to Janie McCormack representing St. Barnabas. 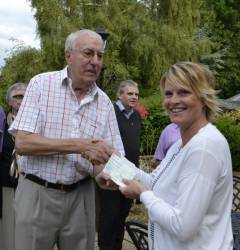 The proceeds were raised at a recent Quiz Night - many thanks to everyone who supported us. 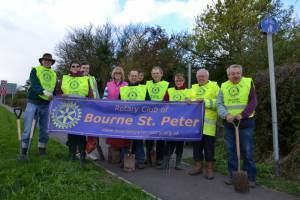 Ten willing volunteers representing the Rotary Clubs of Bourne St. Peter and Bourne planted hundreds of daffodil and crocus bulbs in Bourne town. 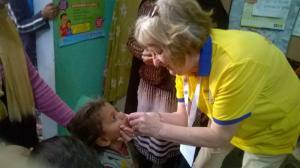 Club President Alan and wife Maggie recently returned from India where many thousands of Rotarians from around the world worked hands-on to immunise 172 million children under 5yrs with the Polio vaccine in just 6 days. 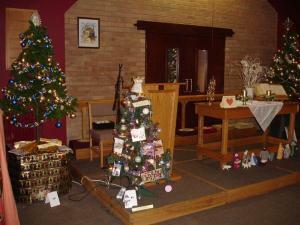 The weekend we displayed our Christmas "Tree Of Wishes" alongside scores of other trees displayed in the Bourne Methodist Church. 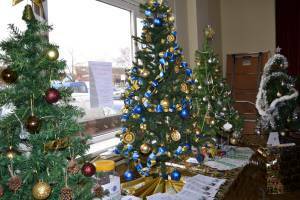 This annual event attracts many organisations to display their trees and promote their causes. This internationally recognised training centre based on a 17acre site has a large number of specialist areas including search and rescue in collapsed buildings, derailed trains, rubble piles, road traffic collisions to mention just a few. 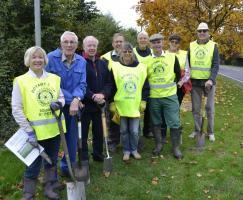 The blustery and drizzly weather did not deter us in planting many thousands of daffodil bulbs in Bourne town again this year. Many thanks to everyone who gave their time and energy to this event. 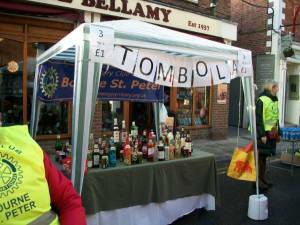 Despite a cold, damp and windy day yesterday, we were all hands to the pumps working on our Tombola Stall. 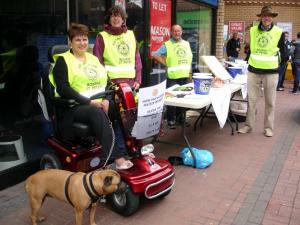 We raised nearly Â£300 thanks to everyone who helped and supported us. 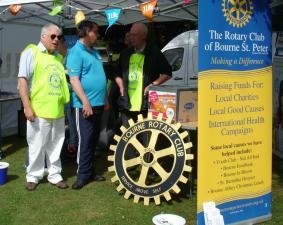 Local charities in Bourne will benefit from all your efforts. We had 68 entries and the winner guessed the value at Â£73.00, the closest to the actual value of Â£73.41. 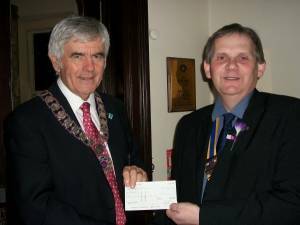 Rather than take the cash sum of Â£73.41, our winner donated the money for our charitable causes - how commendable is that !! Here we are again enjoying the Bourne Summer Carnival that took over the town with stalls, entertainment, continental foods, funfair and more. 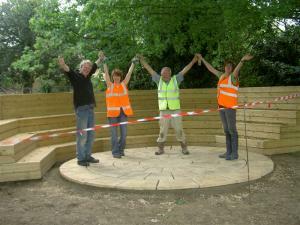 With the support of a Rotary Foundation Matching Grant, we have just completed an exciting project to install a log cabin craft centre and toilet facility for the Mencap allotments in Uffington Road, Stamford. 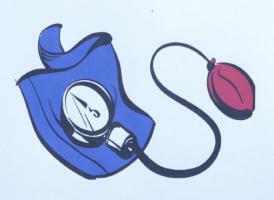 Our pitch at this year's event was promoting awareness of Prostate cancer. We had several static exercise bikes for the public to ride on and a simple competition for anyone to correctly guess the total mileage covered. 21st June was Father's Day! Thanks go to our models Serena, Charlotte and Jane, and all the "runners" who collected garments for the dressing rooms. Many branded named clothes were purchased amongst an audience of about 60 people. 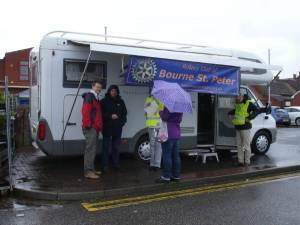 "Shelterbox" on its way to Nepal after the country recently suffered a devastating earthquake. On 29th April 2015 we purchased another "Shelterbox" which this time will be used in Nepal after the country recently suffered a devastating earthquake. 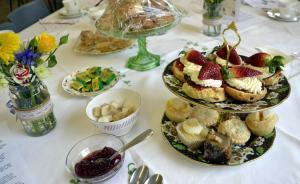 This is a our Mothering Sunday Cream Tea Event held in the Bourne Abbey Church Hall. 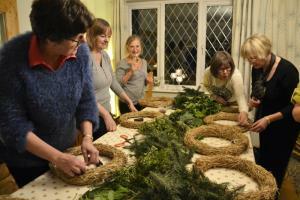 Proceeds will be donated to our local Charity Mencap based in Cherry Holt Road. 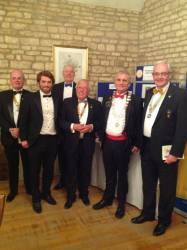 We celebrated our 16th Charter Anniversary on Tuesday 21st April with an attendance of 29 people including District Governor Ken Billington, Assistant District Governor Bill Martindale and Guest Speaker Adam Henderson of the charity Mencap. 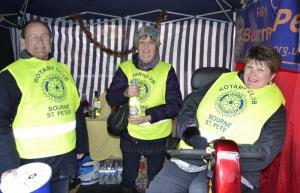 All hands to the pumps as we worked on our Tombola Stall at the Bourne Christmas Market on Saturday 29th November. 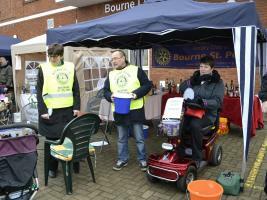 We raised a sum of 380 pounds that will benefit local Bourne charities. 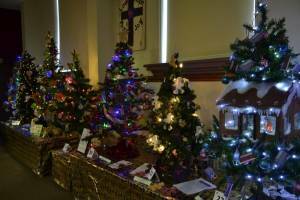 Yet another successful Christmas Tree Festival.Our tree named "The Rotary Tree of Wishes", was one of 50+ trees provided by local clubs, schools and charitable organisations. We handed out scores of little "Bags of Wishes that we made earlier. Joseph Matome benefits from a pair of spectacles we collect in our work with Vision Aid Overseas. Joseph is a 43 year old geography teacher in a small village of the Livingstone region of Zambia. 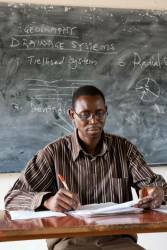 His improved eyesight enables him to continue teaching. 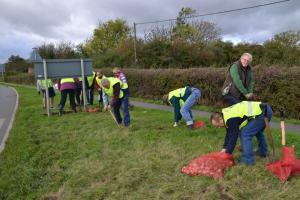 On Sunday morning in heavy rain, we all got thoroughly soaked planting hundreds of daffodil bulbs on the Bourne by-pass. 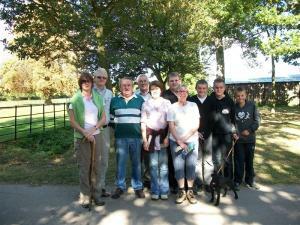 Many thanks to Top Score Bulbs of Spalding who donated the bulbs and all our helpers on the day. 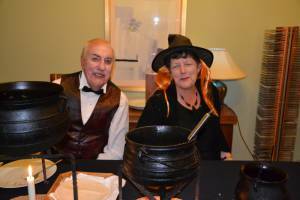 Many thanks to Angela and Kevan in transforming their home for a great Halloween Evening. 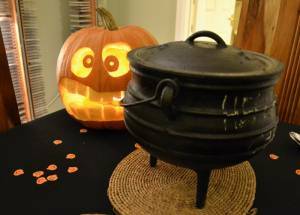 Enjoyed by all, the spookiness was great, so was the food and company - a great evening. A new pottery kiln is now installed and operational at our local charity Sense in Bourne thanks to the generosity of the two Rotary Clubs of Bourne St. Peter and Bourne along with the Bourne & District Round Table. Thanks to our models Serena, Charlotte and Jane, and all the "runners" who assisted, several thousand pounds of clothes were purchased. 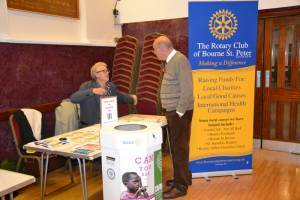 Held at the Bourne Youth Centre, a sum of £377 was raised for Rotary and local charities. 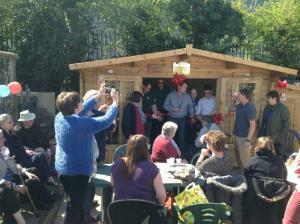 Visit to the Charity Sense, South Fen Road, Boune to officially hand over the new Pottery Kiln. This is a Wednesday evening event commencing at 6:30pm at the Charity Sense on South Fen Road, Bourne (almost opposite the allotments) just 1/2 mile from Cherry Holt Road. 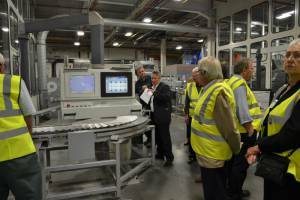 Wine and nibbles with a chat from Manager Dennis Mitchell about the work of Sense. 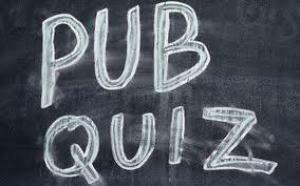 Meet at "The Sugar Mill" Bourne for the quiz at 8:30pm. 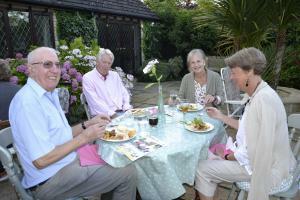 Those wishing to have a meal (Two main courses for the price of one is on offer) should meet at 7:15 to 7:30pm. Family and friends are all welcome to join us. 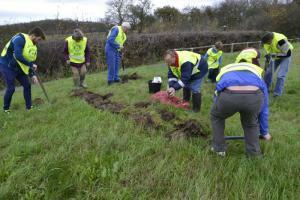 Daffodil bulb planting near the Bourne by-pass island. 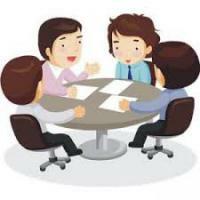 This is a Sunday event where we will meet in the usual place at 10:30am. Don't forget to bring your spades!! 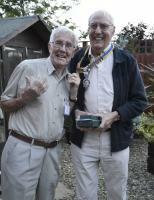 Presidents handover and Presentation of cheque to St.Barnabas 24th June 2014. 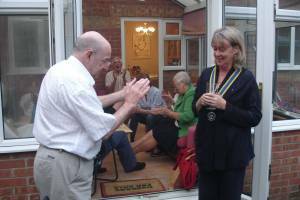 The President's Handover evening held on 24th June 2014 and presentation of a cheque for £1,177 was generously hosted by Maggie and Alan at their home. 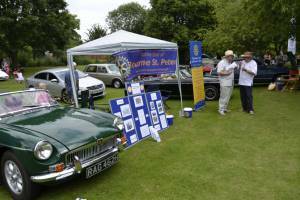 On Sunday 22nd June we set up our stall with 2 classic MGB sports cars and ran an automotive quiz in aid of our nominated charity Mencap. A cracking day - glorious weather, lots of people, entertainments all day and RAF fly-pasts. 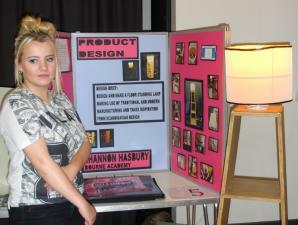 On Saturday 21st June we sponsored Year 11 student Hannah Prince from Bourne Academy in the Rotary Young Designer Exhibition. 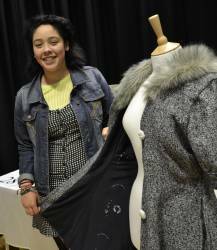 Being one of 29 entrants, Hannah chose to design a garment inspired by Russian culture. Business / Planning Meeting at the Toft House Hotel. Meet in the Toft House Hotel at 7:15pm for dinner at 7:30pm. 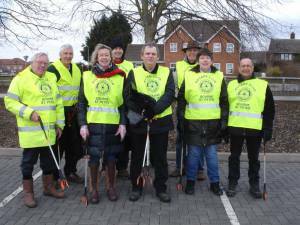 Litter Picking and Bus Station Weeding. This is a Saturday and Sunday event where we intend to invite any willing members of the 'Not All Bad' Youth Club, and any other friends you can muster up!! 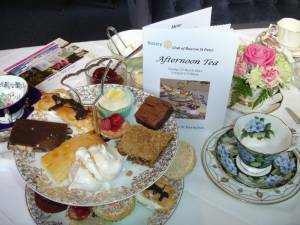 Our second 'Cream Tea' event was a great success, enjoyed by everyone who attended, and we raised a sum of 460 pounds for our local hospice charity St. Barnabas. Click 'read more' to see 16 more photos. 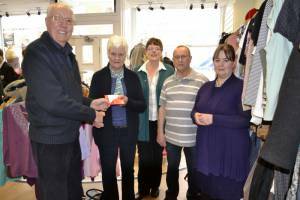 The lucky winner of our 'Guess the Value of the Trolley' is Sue Deaton seen here receiving a Tesco voucher for 75 pounds from Club President Bryan Summers in the Bourne St. Barnabas shop. 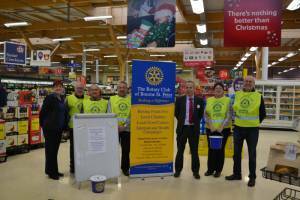 Some members attended a photo-call at Tesco Bourne in readiness for our weekend charity event on Saturday 15th and Sunday 16th March 2014, 10:00am to 4:00pm. Everyone is invited to "Guess the Value of food in the Trolley" and WIN IT!! 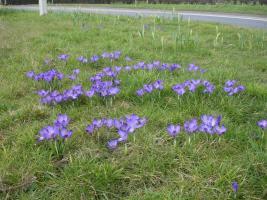 Scores of crocus bulbs were in flower around the Bourne by-pass on Rotary Day 23rd February 2014. 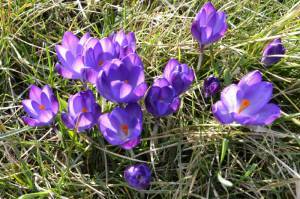 Also referred to as "Purple Pinky Day", the crocus signifies the purple nail dye that is used on children who receive the polio vaccine. Sunday afternoon event on 23d March from 3.00pm to 5.00pm in the Conservative Hall, North Street Bourne. We extend a warm welcome to all members of the public who are sure to enjoy this age old traditional experience. See attached detailed information. 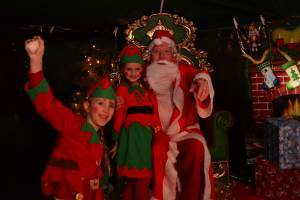 One Club Rotarian stepped in as Father Christmas at a school Christmas Fair on Saturday 7th December and was helped by two willing Elves - the things we members do in our spare time!! 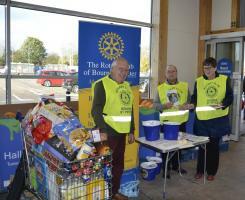 Hundreds of glasses are being collected from our "Spectacle Receptacle Bin" in the Bourne Tesco store. 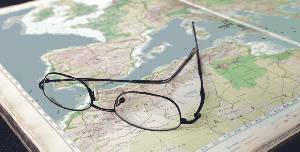 They are all on their way to some African countries where many thousands of people are disadvantaged by poor vision and lack of spectacles. 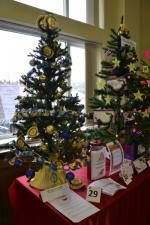 We supported the annual Christmas Tree Festival again this year at the Bourne Methodist Chapel, and were proud of our Rotary blue and gold decorated tree. 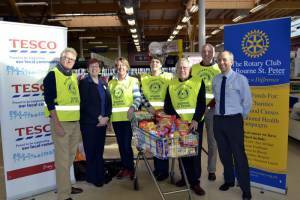 Club Rotarians along with friends and members of our local Youth Club went bag packing at Tesco Bourne to raise funds mainly for Shelterboxes to help families in the Philippines following the recent Typhoon Halyan. Bourne Community Showcase Event giving local organisations the opportunity to exchange ideas and encourage members of the public to participate. 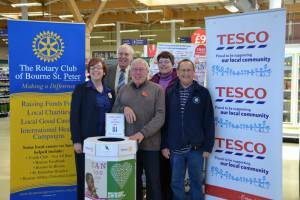 Installing our Vision Aid Overseas Collection box at Tesco Bourne on 4th November 2013. We do like to have fun and this evening was no exception. 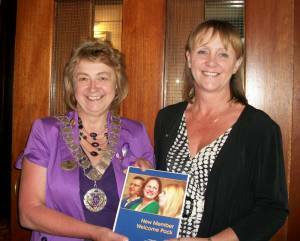 District Governor Margaret inducts Christine as a Rotarian in our Rotary Club on 16th July 2013 at the Toft House Hotel & Country Club. Club members take on the task of painting the flower planters in Bourne to support the town's entry in the "Midlands in Bloom" Competition. 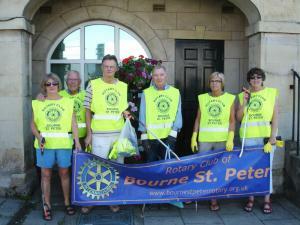 Tackling areas of Bourne town and the by-pass road, some 25 bags of litter were collected. 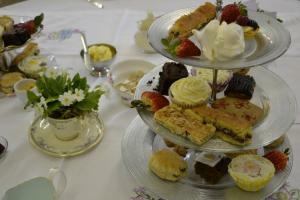 Public Afternoon Tea Event on Sunday 17th March 2013. 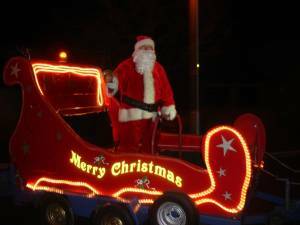 Club members helping Bourne Lions with their Christmas Sleigh as it toured Bourne and surrounding villages during December 2012. 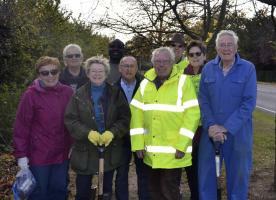 A team of willing Rotarians and friends enjoyed another annual daffodil bulb planting session where three and a half full nets of bulbs were planted on the approach road into Bourne from Toft. 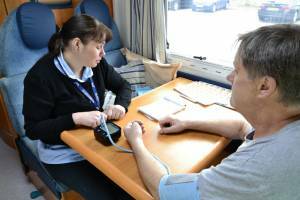 On a wet Saturday morning, we set up a camper van in Bourne Market and approximately 60 members of the public took advantage of free blood pressure monitoring by our resident nurse. 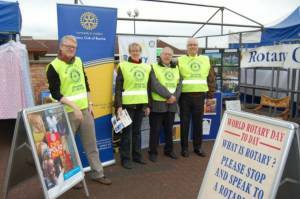 Celebrating and promoting to the public our World Rotary Day in Bourne Market on Thursday 23rd February 2012. 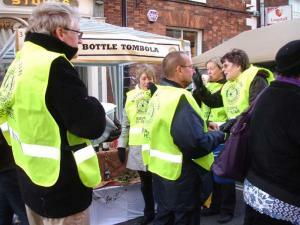 Many Club members on rotation manned this stall during the day sharing experiences and distributing information leaflets. A bitterly cold Saturday but spirits were high and all the bottles cleared in quick time. 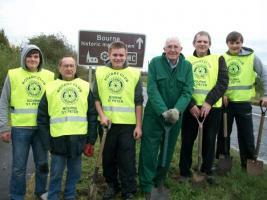 Bulb planting on the roundabout leading into Bourne from theToft and Stamford road on 15th October 2011. 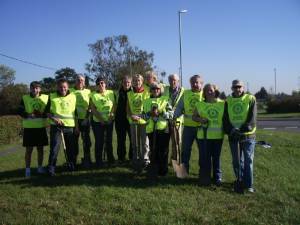 During a bright and chilly Saturday morning on 15th October 2011 we gathered to plant 2,000 crocus and scores of daffodil bulbs. 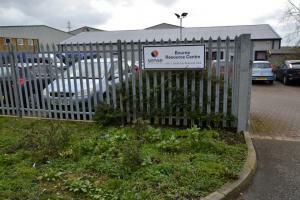 The location is adjacent to the town by-pass roundabout approaching from the Toft/Stamford road. 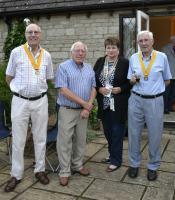 Presidents Handover evening held on 28th June 2011. 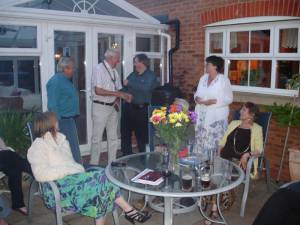 Presidents Handover evening held on 28th June 2011. 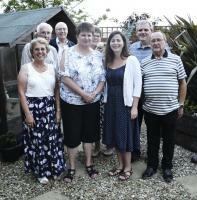 The event was kindly provided and hosted at Caroline & Joe's home with a BBQ and great fellowship between Rotarians , friends and family. 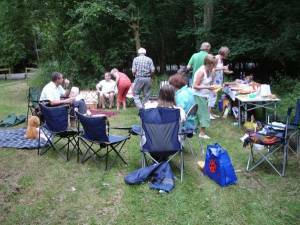 An evening picnic and quiz in Bourne Woods on 20th July 2010. 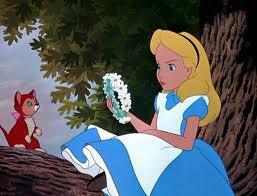 It was eyes down and look in for good food and refreshment. Notice the two teddy bears who joined in with us? This project was funded by a District Simplified Grant and provide a paved patio area to the outdoor teaching area at Bourne Abbey Primary School. 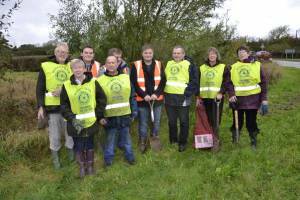 This project is one of several that the club has contributed to.